Don’t wait any longer, Speed Week’s here! Since last year, the MyRideisMe.com crew’s caught major “Salt Fever”. Starting last year, we took in, or at least tried to, the race cars, the scenery and the fantastic people of Bonneville Speed Week. Now we’re hooked. From 400 mph streamliners like the Speed Demon to VW’s and some kind of French owned and raced, Suzuki powered English car, there’s something here for everyone. It’d be easy for me to whine about my drive to Bonneville, but these guys and my new Australian mates shipped their rides in from outa the country! Whatever this is (I’ll try investigate, don’t worry!) I dig it. While this is a serious race car and a seasoned land speed race car judging by the stacked El Mirage participant stickers, this old Ford contrasts sharply with the high dollar, high speed rides at Speed Week. I want a story about this one and the inline six cylinder it’s running. This is what it takes to push a race car 300mph at Bonneville. While owner George Poteet and famed builder Troy Trepanier from Rad Rides have the this slippery Barracuda detailed like one of George’s AMBR or Ridler award winning cars, they don’t get to have any more fun than the dirty inline six team above. Look for a detailed feature of this ride very soon. Hopefully I’ll be explaining how this is the world’s fastest doorslammer, bar none, at well over 300mph. To wrap things up at 1:30 AM at Bonneville’s famous “Bend in the road” camping site, here’s a small taste of the hot rods we’ll be showing from Bonneville. Until tomorrow, these shots will have to tide you over. The Rolling Bones pack of Hot Rods. The silver 34 Coupe was featured in the first story ever published at MyRideisMe.com as a Father and Son Hot Rod story and the black hot rod in the foreground is an Olds Powered Pickup’s shown here. Here’s your standard Hemi powered vintage hot rod that also doubled as the best tow vehicle, hands down, for the “Pecker Heads Racing” roadster shown above. Only at Bonneville! 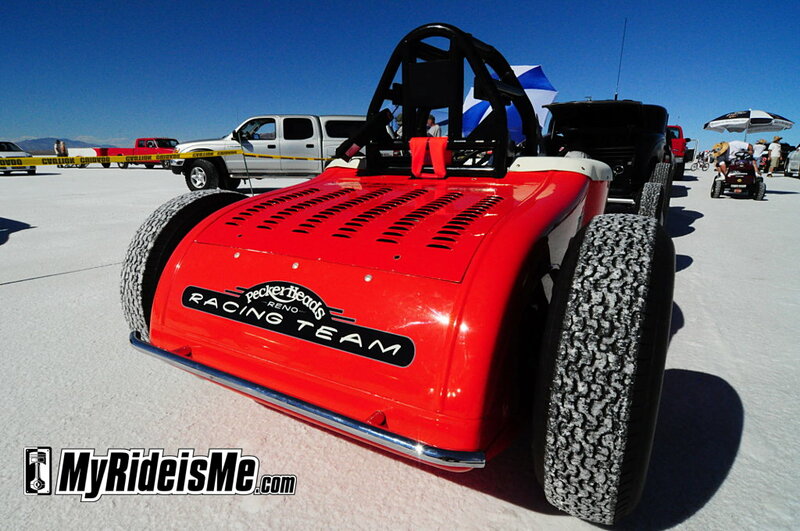 Catch up on everything from Speed Week and Bonneville at MyRideisMe.com in our everything Bonneville Salt Flats post. Want more? Let us know in a comment below. Please locate the World’s Fastest Bagger and post some pics! It looks amazing! They went to Bonneville from Texas (Gruene/Javelina Harley Davidson) yesterday in hopes of setting a land speed record. Will be checking back for some great photos! Thanks! No, ours is black. I e-mailed a picture so you would know what to look for. They are about to run or have just finished. Thanks for your interest! Good afternoon all. I am wondering if you have seen a “bad to the bone” silver colored Ford Thunderbird that is about 4′ total height with a blown solid block hemi and a lift up body similar to a funny car? The boys are there from Oregon with the brand new car and are probably making qualifing runs today. The owners name is Jerry Stroud and he will be there with brother Marty. I would love to hear that they are running good and have a shot to break a record. We would really appreciate a picture seeing this car on the salt. Sorry, I never saw that car… I’d remember. If they’re making qualifying runs, they’d be on the short course and I never made it out there. Sorry! Looking for pics of FKAWI Racing Team/Billy Shoemaker running a naked Hayabusa and a Harley. Previous record holder!! Hello Karma, I remember seeing a bike with the FKAWI name on it. Sorry you won’t be seeing any pictures of motorcycles here except for streamliners powered by bike engines. I will be there tomorrow (8-17), maybe I will see you around someplace. Have you seen the diesel streamliner from Canada? Golden Hawk – it is supposed to be going going for some sort of diesel 4 liter record. I am looking for it. No email for me until tomorrow night can find a hotel. I think I get text but have not tried it, maybe send one to me at the # after my email and see if it works. I guess not the site will not let me put a phone number there and I don’t want to put it in comments. The “English car” above is a Reliant Robin – used to be quite popular with old blokes and tight people as they can be driven in the UK on a motorbike licence. Not sure I’d like to do much more than 50MPH in one but at least there aren’t many corners at Bonneville…what speed did it run?